Home Sport Will Hurricane Florence impact NFL games in Week 2? Will Hurricane Florence impact NFL games in Week 2? Several college football games have been postponed or relocated, but the NFL’s slate of Week 2 games should be OK. 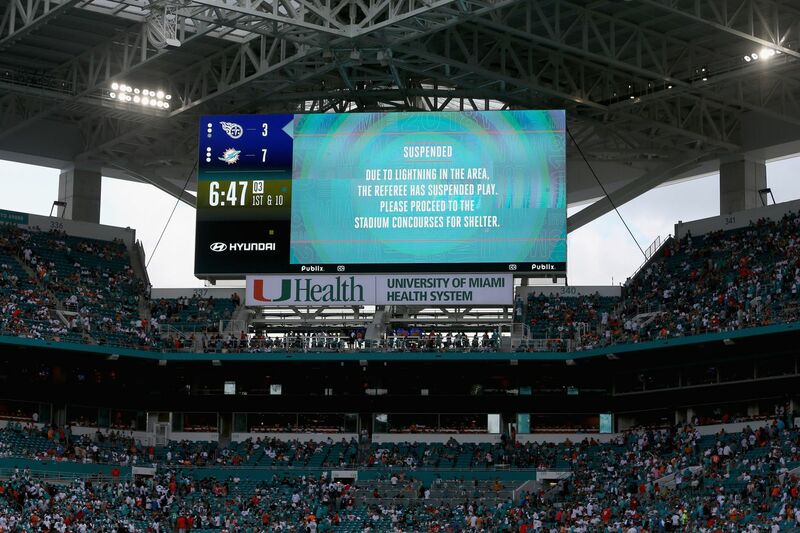 The first week of the 2018 NFL season gave us the longest game ever when the Tennessee Titans and Miami Dolphins took over seven hours to finish due to two different weather delays. Now, Hurricane Florence is threatening to impact games in Week 2. The hurricane is currently a Category 2 with tropical-storm-force winds expected to arrive as soon as Thursday. It is projected to crawl near or along the coast of the Carolinas through at least Saturday. More than a dozen college football games have been postponed or relocated ahead of Hurricane Florence’s arrival. Will the same happen to any of the 16 NFL games in Week 2? Which games could be affected? On Thursday, there’s a game in Cincinnati and Monday Night Football will be in Chicago. Neither are in danger, nor are Sunday games in Nashville, Green Bay, New Orleans, San Francisco, Los Angeles, Denver, and Dallas. But the most devastating effects of Hurricane Florence are expected to be in the Carolinas and Virginia. The games for the Steelers, Jets, Bills, Buccaneers have mostly clear forecasts. The Sunday afternoon game in Jacksonville is threatened only by some wind and possible rain showers. The ones really in Hurricane Florence’s path are the games in Atlanta and Washington, although the Falcons and Panthers will be protected by the retractable roof of Mercedes-Benz Stadium. Both teams are still currently going about business as usual. The Panthers plan to practice in Charlotte on Friday rather than head to Atlanta early, but they are keep an eye on developments. RR says Panthers have several contingency plans in place with Hurricane Florence looming. Georgia Gov. Nathan Deal declared a state of emergency on Wednesday, so the weather could make it difficult for fans and stadium workers to get to the game. But it appears as though the contest itself isn’t in jeopardy. What about the Colts vs. Washington? For now, the forecast at FedEx Field in Landover, Maryland projects a cloudy day without much wind. The Colts are preparing themselves for the possibility of a rainy game, but the NFL is thinking about more severe scenarios. The #nfl told me they are monitoring hurricane Florence and are in contact with both the #colts and #redskins about how the storm might affect Sunday’s game. The #nfl is thinking about contingency plans. A relocation or postponement seems unlikely, though. A year ago, a season-opening game between the Buccaneers and Dolphins was postponed 10 weeks due to Hurricane Irma. A game during the 2017 preseason between the Texans and Cowboys was cancelled due to Hurricane Harvey. Hurricane Florence probably won’t alter the schedule at this point, though.